In residential applications, an air handler is usually used for forced air distribution of central air conditioning. The common air handler is a cabinet with a blower, controls, and houses the air conditioning evaporator coil. Electric heat strips, breakers, and heating controls can be added as an option to this standard air handler. Now, basically, you have an electric furnace with air conditioning capabilities. Same scenario with an electric furnace. Add a cased air conditioning coil and you have virtually the same piece of equipment. Versatility is the main benefit of this type of hvac system. No flues need to be provided. Most units are multi-poise, which means that it can be installed as a vertical, horizontal, or counterflow unit. Your installation is limited only by space restrictions, serviceability, and duct attachment capabilities. In years gone by, an electric furnace or electric heat equipped air handler was usually the last consideration for heating homes. People are now beginning to look at this type of heating more seriously. Factors driving this change are rising and unstable prices of non-renewable fossil fuels, such as natural gas, and insurance limitations affecting oil and propane tank property locations. Folks are also voluntarily considering greener renewable energy sources from which cheap electricity can be produced. Take this fully electric air handler or furnace, add a high efficiency heat pump, and you have the best of both worlds. 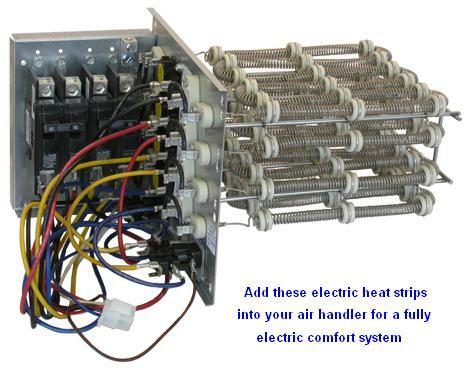 Even in an extreme climate, now the heat pump handles the heating chores 80% of the time, and the electric heat strips take over the heating chores once it is economically impractical to run the heat pump. A true electric furnace is compatible with any basic central air conditioning system and can provide 35,000 btu to 85,000 btu of heat (10kw to 25kw). This will cover most homes needs. Multiple units will cover the larger homes. An air handler can be fitted with heat strips ranging in capacity from 8500 btu to 85,000 btu (2.5kw to 25kw). Both the air handler and electric furnace can be purchased with a power saving variable speed motor.